Enter the date or select it from the calendar. 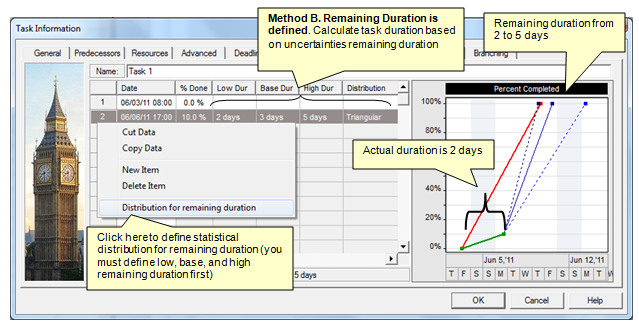 Define parameters of statistical distribution for remaining duration (see Defining statistical distribution for remaining duration for more information). Select the distribution from the Distribution list. If you select Undefined, remaining duration will not be used for probabilistic analysis (analysis will be done using percent completed only) . Define the distribution parameters. The Probability Density chart is automatically updated. You can adjust distribution parameters using the sliders. If you select Normal or Lognormal, you must select the Low and High probability range (P1 and P99, P5 and P95 or P10 and P90). These are "cut-off" parameters; meaning that duration, cost, or start time cannot go beyond these values.